Time to give your streetwear dealers a call…especially if you are into the well-known brand from New York, Supreme. The world famous streetwear brand who is celebrating its 10th anniversary this year has listed down a variety of products for the Spring/Summer 2014 season which include this special version of Jawbone Big Jambox. 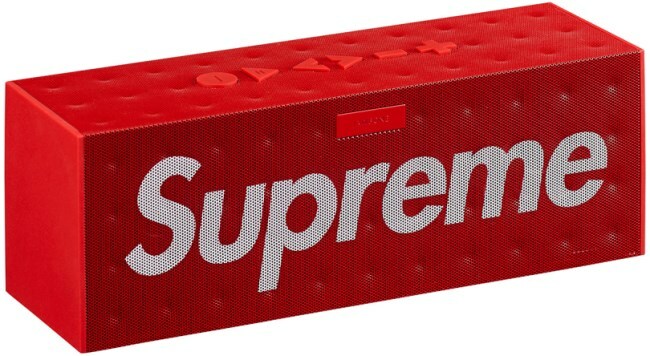 While there should be no differences in terms of functionalities as compared to the standard version of Jawbone Big Jambox, the Supreme version is draped in the brand’s signature red colourway and the huge Supreme logo on its front area. All in all, it is definitely made to cater the hypebeast in you through the combination of the brand’s iconic appeal and music mobility. This is not the first time that both brands have collaborated together though since they have also released the smaller Supreme Jawbone Jawbox wireless speaker last year as part of Supreme’s Fall/Winter 2013 collection. No price has been mentioned at this moment but knowing Supreme, this product is not going to be cheap especially considering that a standard Jawbone Big Jambox already costs RM 1,099. To learn more about Jawbone Big Jambox in general, head on to www.jawbone.com. 2013 vs 2014 Flagship Smartphone – What’s New in Xperia Z2, Galaxy S5 and LG G Pro 2?